Legendary explorer Thor Heyerdal’s epic 4,300-mile crossing of the Pacific on a balsawood raft in 1947, in an effort prove that it was possible for South Americans to settle in Polynesia in pre-Columbian times. ‘Kon-Tiki‘ is a stirring piece of cinema about the daring adventurer Thor Heyerdahl and his attempt to recreate a journey taken 1,500 years ago by South Americans from Peru to Polynesia using only a raft. This Norwegian co-production comes in many formats, and perhaps unusually was filmed in both the Norwegian and English language (to aid with foreign distribution). It was nominated for ‘Best Foreign Language’ film at the 2013 Academy Awards, following in the footsteps of Heyerdahl’s documentary, which won an award back in 1951, and has only just been given a UK release date almost two years later. Thor Heyerdahl is played by the charismatic Norwegian actor Pal Sverre Hagen, who was excellent earlier this year in a villainous role in ‘In Order of Disappearance’, and he brings the perfect blend of arrogant charisma that is required for the role – certainly an actor I’m looking forward to seeing more of over the next few years. The film begins with Heyerdahl and his partner spending time in Polynesia and discovering from the locals that their ancestors had came from the east, and not the west as was commonly thought. This sets Heyerdahl off on his mission to prove the theory, and he assembles a ragtag crew to accompany him on the 5,000 mile trip. Over the course of the 100 days, they encounter numerous problems such as shark infested waters, severe storms and the dangerous realisation that they are sailing slightly off course towards the Galapagos Islands and the Galapagos maelstrom. To do all this on a raft built with no modern equipment is complete madness, but it’s testament to the filmmakers and Hagen’s portrayal that Heyerdahl is infused with such an infectious belief that this will work and his determination shines through even at the deepest points of peril. 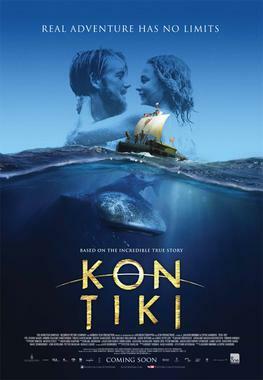 On a technical level, ‘Kon-Tiki’ is a spectacular accomplishment, with the directors knowing when to ratchet up the tension (a scene with a whale for one, and particularly any scene involving the many sharks hunting the waters), and the choice to shoot in open water as opposed to a set may have provided the cast and crew with a more challenging production schedule, but it’s paid off in the increased realism and wonderful cinematography of the vast ocean. Overall, ‘Kon-Tiki‘ is an excellent piece of cinema that pays testament to a magnificent feat of exploration, and I highly recommend it.